Nantucket is one of the most expensive zip codes in the country. It’s also highly protected— roughly forty percent of the island’s acreage is in permanent conservation restrictions. He grows at the Community Farm Institute, started in 2015 by the non-profit Sustainable Nantucket, to provide a low risk learning environment and affordable land to new growers. Dan’s first year he grew on an eighth of an acre. He came in with no experience three years ago from the hospitality industry. The biggest thing for him from the program, “was having the infrastructure to learn quickly without having to put all the up-front costs.” He said he would have never thought of doing this without the opportunity that Sustainable created. The land the Community Farm Institute sits on is owned by Nantucket’s Land Bank. For a long time, parcels like this were purely open space. But Sustainable Nantucket approached the land bank about the idea of incorporating agriculture onto some of their conservation acreage. Sustainable Nantucket’s mission is to try to rebuild the local food system on the island. Dylan says this partnership with the Land Bank has opened up all kinds of opportunities. So far, the Community Farm Institute hasn’t run out of land on its 8-acre plot for beginning farmers, or graduates of the program like Dan. But Dylan says when this does eventually happen, he feels confident these graduating farmers will be able to find permanent growing plots. Dan Southie says for him, the program’s been a bridge between a niche he saw on the island—selling high quality produce direct to chefs—and the land to make it happen. This year Dan’s raising greens, specialty fruits and Duck eggs on about an acre and a quarter for five to six restaurants and the local farmers market. On a nearby plot Dylan grows herbs and peppers to sell in dried spice blends and a woman named Cheryl runs a summer veggie CSA on a quarter of an acre at the Community Farm Institute. 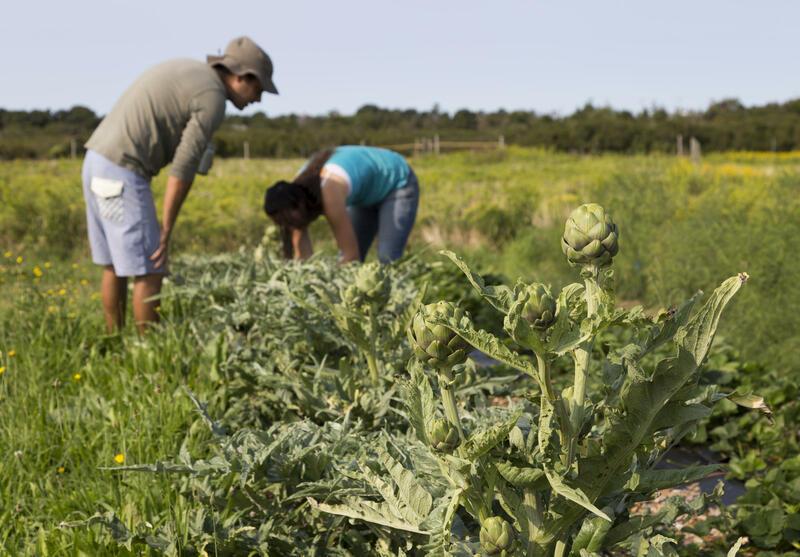 In our area where limited land mass and high real estate prices can make buying farmland tricky, Nantucket’s Community Farm Institute is an inspiring model for public private partnership.